More footage from Jurassic World: Fallen Kingdom has made its way online. Universal Pictures is finally getting ready to unveil the first full-length trailer for Jurassic World 2 this Thursday and they're making sure to hype it up. 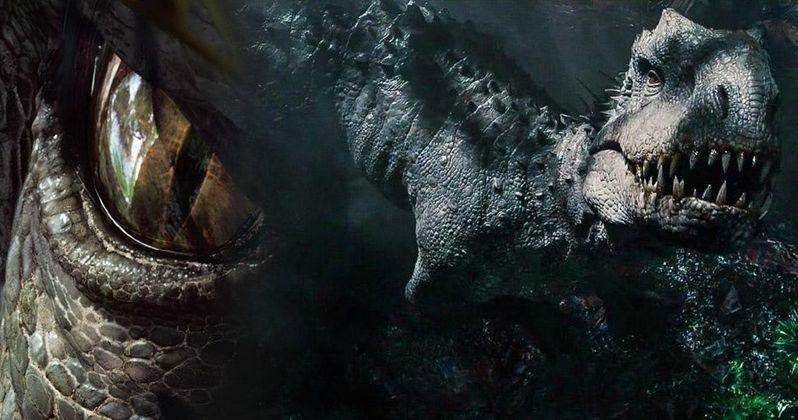 The first trailer teaser was released during Sunday Night Football, with yet another one making its way online today, bringing some brand new footage and the original Jurassic Park T-Rex. This footage from Jurassic World: Fallen Kingdom is a bit more moody and less intense than the first teaser. We see a shot of an erupting volcano, with Chris Pratt's Owen Grady gazing upon it, understandably concerned. We also see one of the new dinosaurs that's going to be introduced this time around, which looks to want to sink its teeth into Bryce Dallas Howard's Claire. From the looks of its teeth-filled mouth, this could be the fan favorite Baryonyx, which showed up in the original Jurassic Park novel but has never been seen on screen. The Baryonyx was confirmed over the weekend for a new Jurassic World 2 AR book, but we're not sure if it shows up on screen. It also almost looks like those human-dinosaur hybrids we've heard so much about in the past. But that isn't confirmed here. Next, we finally move to a shot of the classic Jurassic Park T-Rex, which fans have taken to calling "Rexy." This time, she's sedated in the back of a truck, with Owen declaring, "This is gonna be awesome." Perhaps the best bit of this new footage is that the T-Rex is clearly an animatronic, as opposed to pure CGI. The first trailer teaser, which shows a massive volcanic eruption and a stampede of dinosaurs, relies very heavily on CGI. That was a major complaint among fans with the first Jurassic World. Director J.A. Bayona has promised the sequel will include more animatronic dinosaurs and it looks like that's going to be the case. Will we get to see the actually animatronic T-Rex doing a little more than just laying down in the back of a truck? We can only hope so. Stars Chris Pratt and Bryce Dallas Howard return as the stars of this new set of Jurassic Park movies, alongside executive producers Steven Spielberg and Colin Trevorrow, who directed the first Jurassic World. The movie co-stars James Cromwell, Ted Levine, Justice Smith, Geraldine Chaplin, Daniella Pineda, Toby Jones, Rafe Spall, with BD Wong back as Dr. Henry Wu and Jeff Goldblum reprising his role as Dr. Ian Malcolm. Goldblum has said that his role in the movie is relatively small, but many fans are still excited about the prospect of the character returning to the franchise. The script for Jurassic World: Fallen Kingdom was co-written by Trevorrow and Derek Connolly. Fallen Kingdom is set for release on June 22, 2018. Those hoping to catch the full trailer when it drops may want to tune into Thursday Night Football, as this new teaser promises the trailer will arrive during the game. So, even if you're not a football fan, that may be reason enough to tune in. Be sure to check out the new Jurassic World 2 trailer teaser, courtesy of Colin Trevorrow, for yourself below.